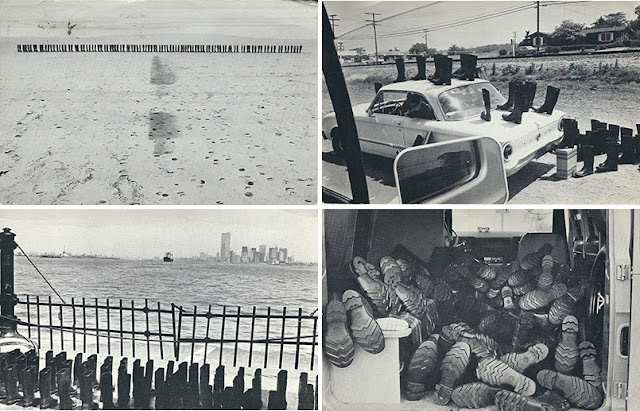 Four details from 100 Boots (1971-73) by Eleanor Antin. Complete series of 51 postcards on view at Alden Projects™. Mail both is and isn’t a personal communication. But whether welcome or unwelcome, it thrusts itself upon you, so to speak, and must be dealt with in the context of your own life. Its immediacy may allow its message to penetrate the usual bounds of your attention. A serial communication can hook you, engaging your long-term interest (intermittently, at least). All works at Alden Projects™ deploy or transmogrify existing narratives into allegories about gender, labor, class, or war in 1970s America. They do so, however, in novel ways, transmitting them through alternative distributions, embracing the particular, transitory functions of postcards with performative modes of address. Bypassing the gallery, these works bring messages home by deploying specific, time-based utterances incorporating the “here-and-now,” and re-directing the recipient’s relationship towards both the present and towards allegorical reflection. 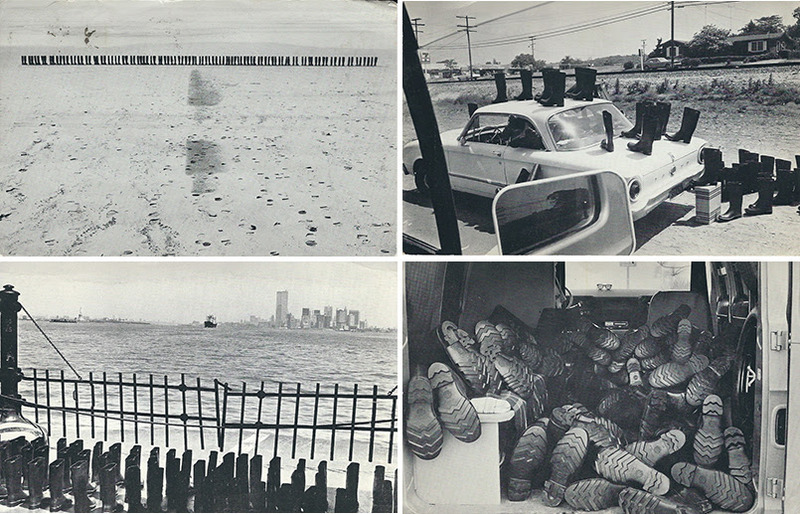 Eleanor Antin’s epic 100 Boots (1971-73), mustering both performance and conceptual strategies, consists of 51 mailed photographic postcards featuring a battalion of 100 black rubber, Army-Navy surplus boots stage photographed in enigmatic and dramatic mises-en-scene from California to the New York Harbor. Begun in the San Diego area in 1971, Antin abstained at that time from printing the photographs (taken by Phil Steinmetz) as gelatin silver prints to be hung in a gallery setting in favor of issuing them instead as serial postcards distributed through the mail to the 600-1000 people on the artist’s mailing list, thereby circumventing the conventions of art’s distribution and reception networks. Delivered with a differentiated, distinctly personal (but also distinctly impersonal) mode of address, the postcards were mailed slowly and in irregular intervals, ranging from 3 days to 5 weeks and spanning a duration of 2 ½ years. All of the postcards are accompanied by plot-driving titles, captions, and specific, changing dates, all printed verso; the artist’s captions methodically announce the date the photograph was taken while another separate date stamp inks the postal service’s cancellation details. An early postcard, 100 Boots Trespass, establishes a “crime.” This is promptly followed by 100 Boots On the Road, featuring Antin’s subjects arranged on a ca. 1961 Ford Falcon, establishing the boots as allegorical stand-ins for a battalion of peripatetic protagonists, and the work as a modern travelogue along the lines of On the Road or Huckleberry Finn, as the artist herself noted. The series unfolds sequentially across changing, scenic backdrops in an ambiguous, but identifiable narrative arc: 100 Boots On the Job; 100 Boots out of a Job; 100 Boots Taking the Hill (1), 100 Boots Taking the Hill (2), and so on. In a 1973 statement, Antin noted how the series’ frames of reference also shift from literary to cinematic frames of reference; quickly, she identified the staged photographs as “highlighted frames from a lengthy movie serial such as The Perils of Pauline (1914).”[iii] Antin’s 100 Boots clearly shares the serialized, homespun, anticipation-building release structure with that of the film’s. Spinning its literary, cinematic, and allegorical yarn not in galleries, but in the everyday contexts of mailboxes and living rooms, the work became infamous through word of mouth. While still in progress, however, Antin announced the boots’ arrival in a different reception context with a different mode of address. “100 Boots Head East,” exclaimed MoMA’s press release, highlighting a dramatic turn of the screw that Antin incorporated into the developing narrative. Once a week for the duration of her exhibition, postcards continued to arrive in the mail, announcing a climax with the arrival in New York City, including a celebratory dance in the Egyptian Gardens bar, a film shoot in Central park, and a final entrance—100 Boots Enter the Museum—cleverly doubling as the series’ fitting ending. A final coda, 100 Boots Go on Vacation, announces the denouement for this series of self-conscious work about work (and works about works). Although MoMA’s 1973 press release omits reference to any allegorical subtexts or interpretations, Antin’s literary and cinematic narrative about a battalion of boots on the ground succinctly brought home the Vietnam war—but also a complex series of time-based counter-narratives—to its original audience. Also present at Alden Projects™ are three important early works by Martha Rosler: A Budding Gourmet (1974), McTowers Maid (1974) and Tijuana Maid (1975) with particular, contemporary relevance. Each work is comprised of 12-15 different postcards. This trilogy is well known, but almost exclusively through Rosler’s later printing and different lay-out in the very different, unitary format of an otherwise bound book, Service: A Trilogy on Colonization (1978). These genre-defying artworks-as-postcard-novels, initiated while the artist was still living in the San Diego area, were not distributed through gallery contexts, but rather through the mail and in relatively small quantities (around 325 each). Rosler returned to the subject of A Budding Gourmet in a different, eponymously titled work (also 1974 and in MoMA’s collection), but eschewing the format of the postcard novel the second time around for that of video instead. Directly connected to her local friend, Eleanor Antin’s concerns with postcards, narrative structures, and alternative distribution and reception strategies, Rosler’s three works also address particular and unsuspecting audiences through a series of language-based postcards mailed in individual sequences on an intermittent basis over a protracted number of weeks. As Rosler noted in 1976, “But whether welcome or unwelcome, (mail) thrusts itself upon you, so to speak, and must be dealt with in the context of your own life. Its immediacy may allow its message to penetrate the usual bounds of your attention.”[iv] The third work, Tijuana Maid (about an undocumented worker) was issued in Spanish, presumably challenging the expectations of her audience, but also telling the narrative in the language of her subject. (Rosler also issued an English translation on stapled sheets). Each series incorporates a curious element: a separately mailed postcard that functions like a colophon, meticulously itemizing among other things, the precise printing, publishing, production and distribution details, all of which were subject to change over time. Incorporating also the precise printing and distribution costs for each “novel,” the artist placed the very particular production and distribution details of her own work (as artist) into direct analogy with the subjects of her work (including unpaid and underpaid cooks and maids) and with the economics of work in general. Finally, Suzanne Lacy’s Chickens Coming Home to Roost (1974-75) is a series of four photographic postcards, drawing on, but also dissecting popular narratives about the relationship and differences between the gendered body, language, and the animal kingdom—in this particular case, the re-staging and co-mingling of (gendered) human and chicken taxonomy. Each image depicts the unclothed artist eating various chicken parts accompanied by a deadpan word or pair of words below forming a kind of discomforting, but also humorous, didactic lexicon for the recipient to ponder: “wing” / “arm”; “arm” / “wing”; “leg” / “leg”; “breast”. The invitation for reflection is explicit in the distribution technique of the postcards, which were personally handed out by the artist. The recipient is particularly invited, further, to consider possible allegorical lessons of “Chicken Coming Home to Roost,” the colloquialism commonly understood to refer to the manner in which bad deeds or words return to discomfort their perpetuator. Combining performance with language-based messages challenging dominant narratives, forms, and conventional distribution and reception strategies, Eleanor Antin, Suzanne Lacy, and Martha Rosler’s postcards all originated (at least initially) in the local and specific context of California in the 1970s. These time-stamped works were destined to arrive beyond the white cube and in personally addressed, specific contexts of the home (and elsewhere) and in slow, well-considered, and drawn out manners, with each causing her audience to receive and to relate to these purposively transcripted, ephemeral works “in the context of their own lives.” Redefining the boundaries of art, life, and work, these extraordinary and rarely seen allegorical narratives at Alden Projects™ went places that work by their male conceptual counterparts, for the most part, did not--or would not. Newly framed, hung on a wall, and re-presented with a very different kind of reception context today, it is only the memory of the original functions of these extraordinary works that keeps them as vital as ever. [i] Martha Rosler, “A Note on One Aspect of Form,” the artist’s introduction printed in Service: A Trilogy on Colonization, New York: Printed Matter, 1978, p. 5. [ii] Eleanor Antin in “Interview with Eleanor Antin Conducted by Judith Olch Richards,” Del Mar, California, May 8, 2009 (n.p.). [iii] Eleanor Antin, as cited in “100 Boots Head East,” The Museum of Modern Art Press Release No. 41, May 30, 1973.